Friday, 11 July 2014: One Hundred and Two Days Old. 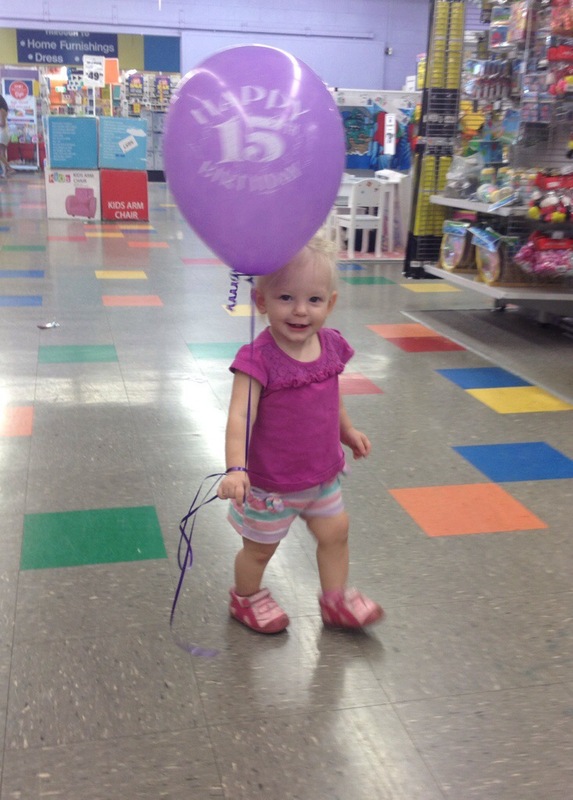 Ayla was given her first balloon today and she wore it on her wrist like she’d been recieving them for years. We were in an arts and crafts shop that also sell party supplies, and Ayla had become too heavy and awkward for me to carry so I’d put her on the ground to toddle around. Ayla had a wow of a time pulling packets of beads and spools of ribbon off the shelf while I wasn’t looking; gosh that kid can make a mess real quick! But although I might not have been watching, the lady behind the counter had been and Ayla’s curious antics won her a new fan. When we approached the counter the lady ooh’d and ahh’d at how cute Ayla was, and giggled at how excited Ayla got when she saw a bunch of helium balloons ready for some customer to come and collect. While I was putting my change away, the lady went and got one of the balloons and had a wrist-knot ready before I could blink. Ayla watched intently as we slipped the ribbon over her hand and when I put her down she began squealing with delight!